Hello, happy Friday, and welcome to the Peachy Keen Stamps September Release Blog Hop!! Have you seen some amazing things on this hop, or what? I just LOVE this release, and have had so much crafty fun working with these new stamps, and by now, I'm sure you're loving them, too!!! If you have hopped here from my dear and talented friend Janice's blog, then you are on the right track, but if you just happened along, then PLEASE go back to the beginning at the Peachy Keen Stamps Blog and start from there, so you don't miss a thing. When I saw the PK-647 Fall Fun Faceless stamp set I was assigned with the pumpkins and fence, The Five Little Pumpkins rhyme, which my kids loved when they were little immediately popped into my head, and I knew I wanted to make a little book for my grandson. At nine months old, he loves to be read to, and I get a kick out of him studying and looking at all the pictures in his books. This was so totally a labor of love, and labor it was!! I was elbow deep in little pumpkin cut outs and fence, and I began to wonder it I'd ever get them all cut and colored!! Persistence does pay off, though, and when I got down to the point of putting everything together, I was in hog heaven!!! I've got a lot of pictures here to show you, so I guess I'd better get to it!! This is the front cover complete with title. The book itself is an acrylic album that I covered with this wonderful K&Co. paper. Did you know that you can find an assortment of acrylic and chip board albums in the Peachy Keen Stamps store? For page 1, I added a ribbon embellishment on the center pumpkin and at the top of the page, and I used some dimensional stars throughout. All images are stamped on Express It Blending Card, and colored with Copic markers. The grass throughout was done with a Martha Stewart grass punch. The leaf ribbon was gifted to me by a friend, and worked just perfect for this. It's times like these that I'm happy I'm a hoarder of such pretty things! ;-) Each page throughout the book is sponged with Tim Holtz Antique Walnut Distress Ink. The little witch on this page is the PK-604 Bewitched stamp. The fence here, and on each page was stamped with the fence stamp from this set, then hand cut... yes, each little piece!! Took me forever, but was so worth the effort!! On this page, and some to follow, I added some orange velvet rick-rack. All of the faces througout the book are stamped with the newly released PK-485 In Stitches assortment face stamps. I LOVE this polka dotted paper!! Everything on this page was done in black card stock, and the eyes were heat embossed with Versamark, and white embossing powder. Once it was dry and cool, I colored the pupils of the eyes in with a black Copic marker. The edges of the page, and the pumpkin silhouettes were sponged with a sponge dauber and white craft ink from Stampin' Up!. I also sponged the fence and edges of the grass to make them pop. And finally, they're all rolling away. I did use my Copics to darken up the fence just a little bit. This is the finished book, once inside the page protectors and with the ribbon and fiber trim. I decided that it might be a good idea to protect the pages from tiny little fingers, and since this album was 6x6, the pages fit perfectly in 6x6 page protectors. I just trimmed off the edges of the pages, where they would normally have fit into a post bound album. As I mentioned earlier, this one was a labor of love, and I hope you like it!! I think baby Max will. Here's a look at that little rascal enjoying one of his favorite farm books. I had to have just a wee bit more fun with this wonderful new stamp set, so I colored up this image and decided to put it onto a Fall card. Let me tell ya, that this one was finished in a flash compared to the last project! For this card, I used some Papery Trey patterned paper that I had stashed away. I cut the image with my rectangle Nestabilities, and colored with Copics of course. I finished this card with some vintage brads, grosgrain ribbon, and the sentiment, which was stamped then punched with Stampin' Up! punches. So ya wanna know how to win free stamps along this hop? It's very simple. Just follow along with the hop, and leave a comment on each blog along the way. Angelica will draw a random winner for each new stamp set from ALL the comments on each blog along the way! Would you like some more great news? 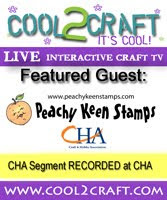 ALL of the stamps being showcased today are available for sale now at the Peachy Keen Stamps Store, AND there's great savings offered for your orders. Beginning today, in celebration of the anniversary of PKS, you will receive the following discounts when placing your order. Spend $75+ get 25% off! These discounts will be in place the entire weekend, so don't delay!! Place your orders before the time's up! The clock is ticking!!!!! Whew!! What a long post, but we've made it to the end, and now it's time to hop along to my dear, sweet, and talented friend Viv's Blog. Please tell her I said HI when you get there, and I know you're going to REALLY enjoy what she's got to share with you. Have a wonderful day, a blessed weekend, and I wish you lots of happy stamping!!! Here's a look at the entire stamp set that I've worked with today. Below, please find a complete list of stops along this blog hop, just in case you happen to get lost along the way. OMG...what great projects! The spooky eyes is just the best. I love all the pumpkins, I would never think to do such cool pages. Thanks! Lorie I am blown away by the book you made for your precious grandson Max! It is truly a work of heART!! I could just look at it over and over. I am amazed by all the thought and all the detail that went into this labor of love! The changing faces and scenery, the spooky lights out page, and the final page of rolling pumpkins, GENIUS!! Totally LOVE this! Your card is a beauty too! That book is crazy amazing! OMG Lorie. I mean WOW! It just looks so AMAZING. Love your projects. Your book is perfection! A mother's love for her child holds no boundaries - you have created a permanent memory for you both! Beautiful project! Wishing you a happy weekend with your family. Oh my gosh!! How cute is that book!! He will just LOVE it!! so fun!! Your card is amazing too, love it! :) TFS! this was amazing!! too cute! I had forgotten all about that song! thanks for the reminder! Ohhh I love thoswe pumpkins!!! I think I may NEED them! TFS! CUTE cards! OMG your book is awesome I just love it. What a great gift for your granson WOW! AMAZING!! AMAZING!!! I LOVE this book! You did a fantastic job. I love the pumpkins and their little faces!! What a great little story book. I enjoyed the story and your creativity with the new peachy stamps. Woooooo, love your colors and your non-color. Great job. Thank you so much. oh, all are great. I love the little glowing eyes on black!!! Too cute!!! WOW~ is all I can say!! Your projects are AMAZING!! I love that book so well done and such beautiful coloring! These are all too cute, I ;le the little pumpkin patches. Great job showcasing the Peachy Keen Stamps. O my goodness this must have taken alot of time and thought, so cute!! Love the way you did the last second last page!! Dear Lori, I must say WHAT AN AWESOME GRANDMA' you are!!!! lLove all your projects, you put my imagination into high gear now, I just hope I get some time to play!! TFS. Have a wonderful day! Lorie! What a beautiful book for your grandson! Very detailed and vibrant. That will be a family heirloom/keepsake -I'm sure! I really love your projects. Thanks so much for sharing with us. OMGOSH that book is super cute!!!!!!! im sure your grandson (who is adorable by the way) will love it! thanks so much for sharing! Wow Lorie! Your book is BOO TIFUL!! ;) Really, it is so pretty. I know it will be cherished. Your work is so pretty! I love your card & this new Peachy Keen release too! CUTE!!! The last one is my favorite!!! Love your projects. These new stamps are awesome! Oh my goodness!!! Can I have you for a grandma!!!! Amazing!!! Just Amazing!!!! Wow Amazing!!! That is Amazing!!! LOL I just cannot say or think of anything else to say because That Creation is AMAZING!!! Enjoy reading it with your grand baby!!! This book is out of this world! What a treasure! Your card is very beautiful! I absolutely love these stamps! This was truly a labor of love. This is my first visit to your blog and I'm definitely going to be a follower. Unless you are crafter you wouldn't appreciate all the time and effort (and the creatively) that went into your album. Thanks for sharing. beautiful cards - these stamps are so cute..
Oh my goodness....how perfectly adorable! My kids love to sing the song ;) Thanks for sharing with us! Oh what a lucky, lucky grandson you have! I can just see the love that you poured out on to each of the pages! This is the sweetest thing I have ever seen! I love the "5 little pumpkins sitting on a fence" and even though my kids are 29 and 31 (no grandkids yets...sigh) I can still recite it! Just beautiful grandma! Lorie, Your granbaby is just darling and he is going to be thrilled with your Fabulous and Awesome 5 Little Pumpkins book! Lorie it really is stunning!! I'm in complete awe of your talent!! Max is one lucky little boy! that halloween book was absolutely tooooooooo cute OMG !!! wow what alot of work and talent! That book is simply to cute!! Thanks for sharing these awesome projects today. ohhhh that book is a treasure!!!! Great job its FAB! That book truly is a labor of love and what child wouldn't want to own it. You did a fantastic job. That book is scary cute lol!! I love it!! Such wonderful creativity. Like the book/story & card. Aren't grands great? Max is so lucky to have a talented Grandma to make such a beautiful book for him! I don't want to short the card as well. Great job!!! what an amazing job, and that is going to be an AWESOME book! Great job! Your very talented!! Oh my! What a fantastic labor of love! Absolutely wonderful job! OMG I LOVE IT, AWESOME,AWESOME,AWESOME!!!! What a fantastic labor of love! You did a wonderful job! Your book is super cute!! I also like the card! Thanks for the great ideas! one done in black card stock. The Happy Harvest card really neat. Wow, this project has to be the winner of the Academy Award of Papercrafting!! It is honestly the best think I have ever seen. I can tell how much love went into this. My favorite pages are the lights out and rolling pumpkin pages!! Thank you so much for sharing your awesomeness with us. justso cute. you do a great job using them. Love all your cool projects. Great blog also. OK!!! That's IT!! I draw the line!! Never again am I going to follow you in a blog hop!! How can I hope to follow THIS beauty!! Ha Ha! This book should be on TV!! I've never seen anything like it and I absolutely MUST see it in the flesh my fabulous friend. You have to adopt me or I'll throw my toys out of my pram! Wow, you book is so adorable. I just love it. If baby Max doesn't LOVE this true labor of love book, he's grounded til next Halloween! (OK, maybe not, he's so cute!) Unbelievable! Such talent! The other 2 projects were incredible too. Wow!! Awesome book! Love your card also! What a heartwarming labor of love. You rock, grandma! Wow!!! This book is fabulous!! You did an absolutely fantastic job. This is my favorite on the hop!! Awesome job!!! Love all those Peachy faces. Lucky little guy. Bet he loves his book. That book is so sweet and if it survives his childhood, what a great keepsake. I have seen so many creative uses for these wonderful stamps, gives me more reasons than ever to buy them all! You are kidding me right! That little book is so stinkin cute I just can't stand it! You did such a wonderful job on it! Very, VERY cute projects. TFS! WOW-I am so impressed with this book! I know it was a lot of work, but it was so worth it! What great projects! That book is fantastic!! TFS. Your book is so priceless! It is just an amazing work of art! OMG! I want that book! LOL! That is the sweetest thing ever! Love it! I remember this book, too, from when my daughters were little. They are now all grown up, but now I have two grandsons who would love your book! What a wonderful job you did! I know it must have taken many hours of work (but fun work)! It will be a wonderful keepsake for your grandson! You color beautifully! Fantastic book!!! Love the pumpkin faces! WOW! Those orange pumpkins really pop! Awesome job! I am completely in awe of the book! When I saw the cover I thought - what a great idea, I can do that. As I scrolled through the post and looked at each page I said no I can't! Wow.. what a labor of love! ok and the BLACK page IS MY FAVORITE! wowser and then I just had to laugh as the pumpkin's 'ROLL' off the fence. Super fab!! Fabulous fall card and the book is fantastic! Lorie, Absolutely love the book, what a great idea. You inspire me with your copic coloring. I love love love this book! The ghosts are amazing! You did such a wonderful job with this!! Wow! What a fantastic book! Love the card too! Oops meant to add that your card is beautiful also. Great job with the new PK stamps. Love the faces on the pumpkins. Thanks for the blog hop and the inspiration. Oh my, your book is awesome! 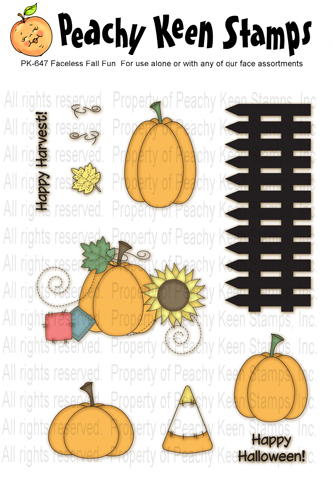 Love the peachy keen stamps. Oh My Gosh!!!! your story book is AMAZING!!!. Love it. I don't know what to say but WOW!!!. OMG what an awesome book and the cards outstanding Lorie. These are all so adorable!! And what a cute baby!! Wow Lorie, The book is adorable and I just bet your Grandson will love it. the happy Harvest card is very pretty!!! I LOVE the 5 little pumpkins!! Its the cutest yet!! Your book is amazing! Love all the details! Love, love, love your book. One of my favorite Halloween rhymes! these card creations is FANTASTIC!!!! This book is fabulous. I am sure your grandson will love it. I wish I had your patience. tFS the entire book with us. What a wonderful book and card, thank you for creating them and sharing them. Just wonderfful! You have inspired me to try to make books for my neices and nephew. I know they would just love it! OMGosh! Lorie, you continually amaze me with your awesome creations and this one tops the list!! Yes, truly a labor of love and I'm sure will remain a favorite family treasure for little Max throughout the years...One for him to pass on to his offspring. Absolutely stunning!!! Love your beautiful card too. You should enter in the Crazy 4 Challenges as I believe it meets the challenge of creating a card with orange, olive green, yellow and brown! OMG those pumpkins are sooooooooooo cute!!! The book is AMAZING! Love it! Great job on all your creations! but the spooky eyes! wow love it! Your cards are so awesome, The cutest things! Great job! TFS! your little pumpkins are so cute! How cool, love your project. Great fall ideas. OMG, I'm absolutely blown away by how adorable your book is and your grandson is one lucky little boy!!! My favorite page is the one when the wind blows out all the lights.. You are so creative.. Your card is gorgeous too..
Wow you did an amazing job. Love the colors. Your talent is unbelievable! Love everything! The ghost idea is great! The pumpkins and the way you worked with them and the faces are my absolute favorite. Love your talent. Love the wonderful Halloween projects you made. So inspirational and love those pumpkins. WOW! I'm pretty much speechless, and that's really unheard of for me! That book is phenomenal! I think the colors and the ribbons will certainly cath your sweet little grandson's attention!! I'm excited to be a new follower! That is such a wonderful book. I love all the pumpkins and the story. Any child would be blessed to have that one on the shelf. It's amazing that everything looks so real and comes to life. I would love to have your talent. Keep up the great work and thanks for sharing. Your book made me smile today. What you did with those punkins and the face stamps was just fabulous! Thanks for the smile. This is so adorable, how clever you are! Great job! WOW!! Your book is amazing!! Fantastic job!! I just blown away! I love this project ESP the page with the eyes using embossing powder! Very cute idea! OMG I absolutely LOVE this project. The pages are so cute!! I especially love the lights out page.. and the little bright eyes. You have really done a great job on this. That book is awesome! I love it! The card is wonderful too. OMG!!! Your book is amazing. That is one lucky little boy. Best project of the hop thus far. Thank you for sharing your creativity. You should win a award for that book. Max is one lucky little boy. Wow, Lorie these are really great!!! I'm getting this set along with the pumpkin faces & I was just working that paper today, trying to figure out what I wanted to do. Too funny! Well, you've given me lots of inspiration that's for sure!